Now, I have the great fortune of living near one of the best farmers’ markets pretty much anywhere in the country — a few times a week, farmers from the New York area show up at Union Square in Manhattan to set up shop for a day, peddling fragrant breads, beautiful pies, lush greens and more. Unfortunately, I’m usually too lazy to hop on a train to head over there — far easier to just walk to my local market in Brooklyn Heights. This is a small but delightful market. Its tomatoes will enchant, its green eggs — oh, my. And of course, this being summer, fresh corn is everywhere. First, I got some corn and a nice-looking zucchini. 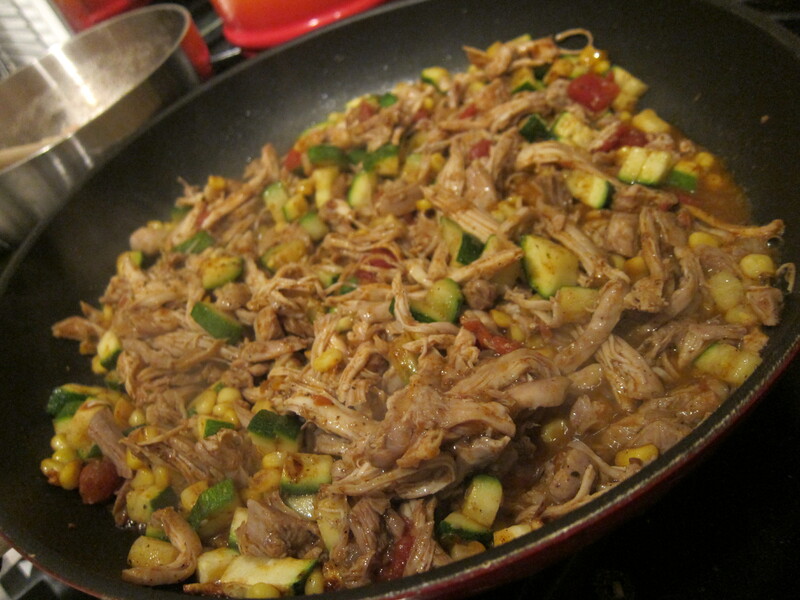 Then I fried up the diced zucchini and corn kernels with gobs of garlic and a home-made taco seasoning before adding in the chicken and gravy. Before too long, the kitchen was packed with the giddy scent of cumin, chili, oregano and more. As soon as the stew was heated through and the rice cooker button had popped, we were ready to go. This is not a stew for the faint of heart — the zing of each bite will have you reaching for that beer for a nice chilly foil. But it is, if I may say so myself, one incredible stew. And one that gets better the next day as the flavors have had a chance to mingle. So here’s to summer and to farmers’ markets everywhere. And to the lazy days of August — a perfect time to celebrate them both. Don’t forget to check out the Let’s Lunchers’ summery farmers market-inspired dishes below! And if you’d like to join Let’s Lunch, go to Twitter and post a message with the hashtag #Letslunch — or, post a comment below. 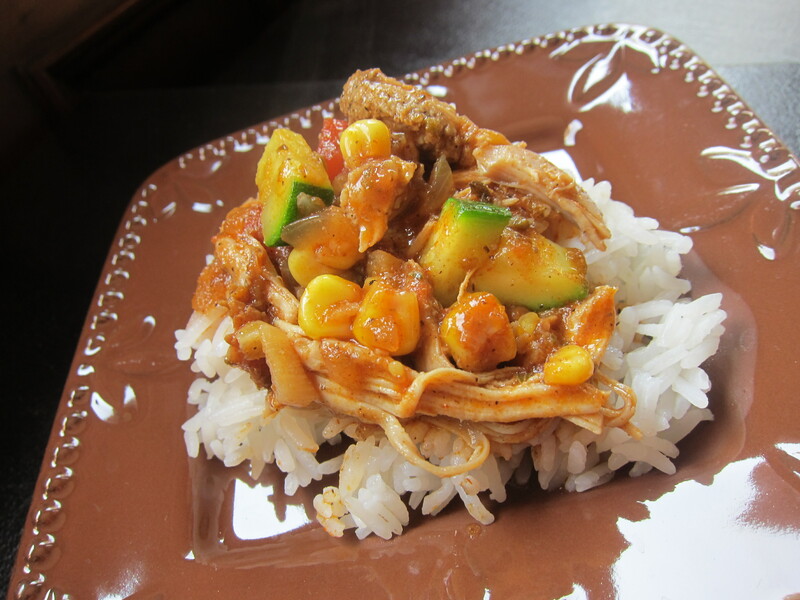 Braise chicken in Mexican spices, using the recipe above. I advise doing this the day before, taking the chicken out of the tomato gravy and shredding it, storing both of those in separate containers. This allows the flavors to mingle a little more in the gravy. The next day, take the gravy and the shredded chicken out of the refrigerator and allow both to come to room temperature. Heat up a tablespoon and a half (or two) of oil in a pan with high sides. When the oil is glistening, add garlic and stir fry quickly. Once the garlic is fragrant — about 30 seconds later — add zucchini and fry that up until it’s slightly softened. Add corn and mix well, then add a few teaspoons (two should about do it) of taco seasoning and stir-fry that until heated through and well combined. Add shredded chicken and mix well, heating through. Finally, add tomato gravy and combine well. If the mixture is more chunky than liquid, add chicken broth by the quarter cup-ful until you have your desired consistency. Bring to a boil and simmer for a few minutes, add salt and pepper to taste then serve immediately over hot rice.